Although Georges Franju’s feature film career was contemporaneous with the nouvelle vague, his work has little in common with that movement. If anything, he seems to have drawn more from Jean Cocteau and perhaps Marcel Carne. He has less interest in deconstructing the mechanisms of cinema than did Godard, Truffaut, Rivette and others in the late ’50s and ’60s, but rather explored the relationships between movies and surrealism, eschewing narrative logic in favour of the intuitive connections between events which characterize dreams. His films are not interested in social or psychological realism so much as our subjective experience of a reality which can be known only indirectly and interpreted as best we can. 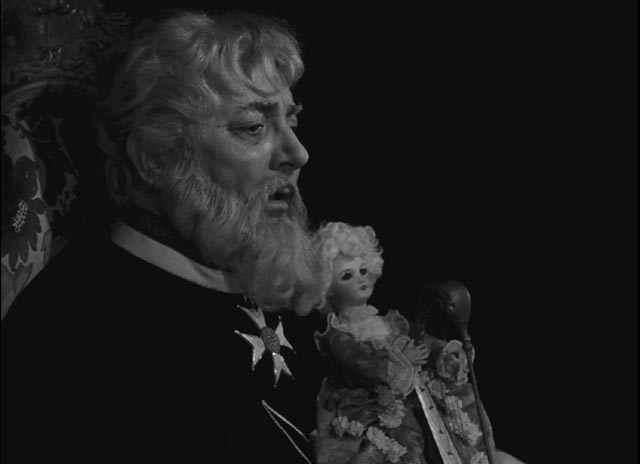 After making a number of documentary shorts throughout the ’50s – the best known being Hôtel des Invalides (1952), a chilling meditation on the consequences of war, and the even more chilling Le sang des bêtes (1949), a study of a slaughterhouse located in a Paris suburb which combines lyricism with images of graphic horror – Franju made his first feature in 1959. La tête contre les murs (Head Against the Wall) is an exploration of the nature of sanity which is set in an institution whose very purpose of containing the insane imposes its own perceptions on those it imprisons. As in other works set inside mental hospitals (Sam Fuller’s Shock Corridor , Milos Forman’s One Flew Over the Cuckoo’s Nest , even Anatole Litvak’s The Snake Pit ), self-perception is overruled by external definitions of what constitutes “normal”. Thus, an ideal starting point for Franju’s exploration of the conflicted intersection between subjectivity and the material world. 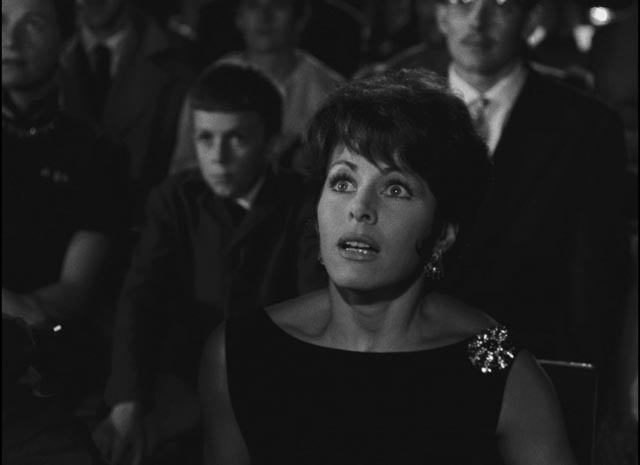 This theme is deepened in his second, and most famous, feature, Les yeux sans visage (Eyes Without a Face, 1960). As adapted from a novel by Jean Redon by Boilieu-Narcejac (the collaborators whose work had previously provided the basis for Henri-Georges Clouzot’s Les diaboliques  and Alfred Hitchcock’s Vertigo ), this is the story of a brilliant surgeon who, driven by guilt about a car crash which left his daughter severely disfigured, kills women in order to steal their faces in an attempt to graft them over his daughter’s scars. Although the film’s graphic depiction of surgical procedures shocked audiences and critics at the time, what has given it a lasting place in cinema is not so much these horrors as it is the poetic imagery of the surgeon’s daughter Christiane (Edith Scob) drifting like a sleepwalker through their home, her face erased by a featureless mask which provides a placid exterior to conceal the psychological torment which threatens to overwhelm what remains of her personality. The horror of her existence is made that much worse because her father’s murderous experiments are conducted out of paternal love which has become monstrously twisted by guilt. As a result, Pleins feux sur l’assassin is a film made up of moments – some of which seem perfunctory, while others obviously engaged the director – which never quite gel into a satisfying whole. 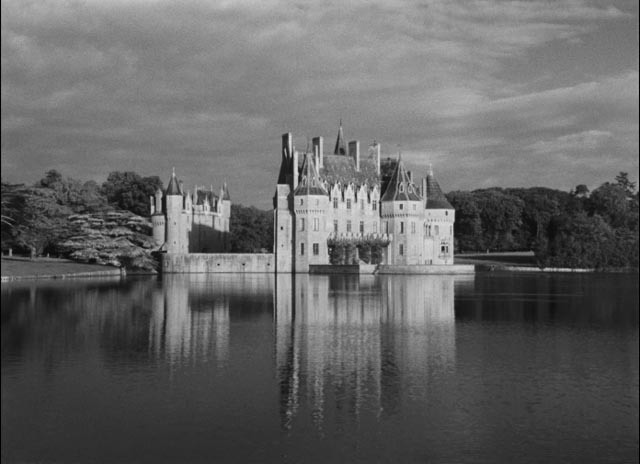 The cast is strong and the location – a castle in Brittany – visually spectacular, and at times Franju achieves a level of poetic expression which rivals Les yeux sans visage, while the narrative structure enables him to explore the relationship between cinema and its audience, held in thrall to a kind of waking dreamstate which depends on the mind’s power to create powerful emotional experiences from fragmentary perceptions. The subjective nature of cinema is built into the film through the device of a son et lumiere performance put on at the castle to retell a tragic love story from centuries past. That story is reiterated by the film’s modern characters, bringing about a tragic conclusion which coincides with the climax of the performance as if the past had the power to impose itself on the present. It’s in these moments that Franju’s interests are most fully engaged. 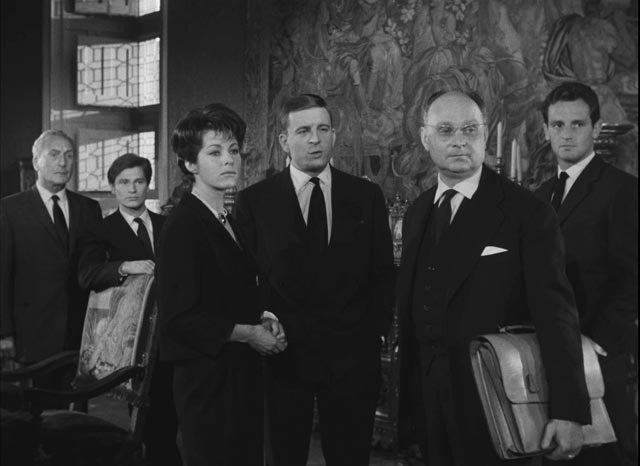 The film opens promisingly with a prologue in which the Comte Hervé de Kerloquen (Pierre Brasseur, who played the surgeon Génessier in Les yeux sans visage), dressed in the formal robes of a Templar, surveys the opulent rooms of his castle and then retreats into a small cubby behind a two-way mirror, where he sits looking out at a room as if at a movie screen … and then dies. The following day, various relatives gather at the castle, having been told that the Count’s death is imminent, only to find themselves trapped in a legal conundrum: it is obvious that the Count is dead, and yet no body has been found, so the estate can’t be settled for another five years. And yet these relatives, who can’t benefit from the estate materially, must assume responsibility for its upkeep until the five years have passed. The Count has thus inflicted a cruel joke on his greedy relatives. 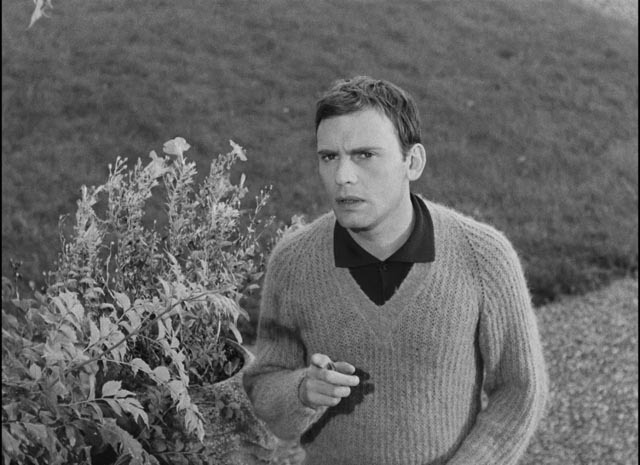 Among the group is young Jean-Marie de Kerloquen (Jean-Louis Trintignant), who alone bothered to make at least a formal gesture by showing up with a funeral wreath dedicated to his uncle. It is Jean-Marie’s lively girlfriend Micheline (Dany Saval) who suggests that money might be made to off-set the expenses of maintaining the castle by putting on the son et lumiere show in which (as the term indicates) light and sound are used to tell the story of an ancestor, his young wife and the lover she takes, an affair which led to the murder of the lover and the suicide of the wife, who threw herself from a tower. 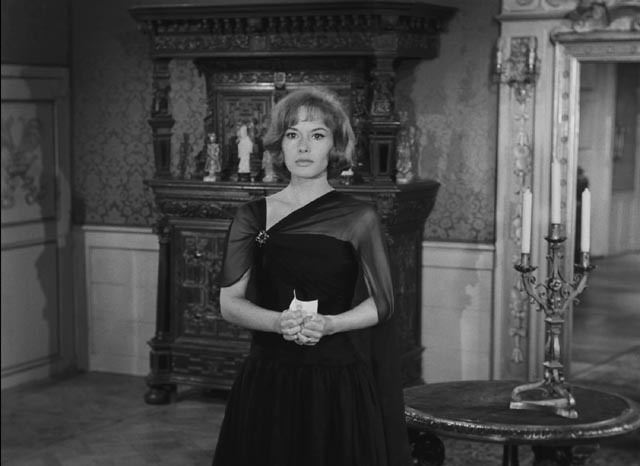 As plans for the show proceed (involving installation of elaborate electronic equipment both inside the castle and around the grounds), it appears that someone has decided to start bumping off the competition for the inheritance – but this Agatha Christie-like narrative element is handled perfunctorily, as if Franju had little interest in it. He is more engaged by the reiteration of the historical tragedy in the story of Jeanne (Pascale Audret), a Kerloquen cousin, her husband Claude (Georges Rollin), and her cousin André (Philippe Leroy) whom she loves but couldn’t marry. 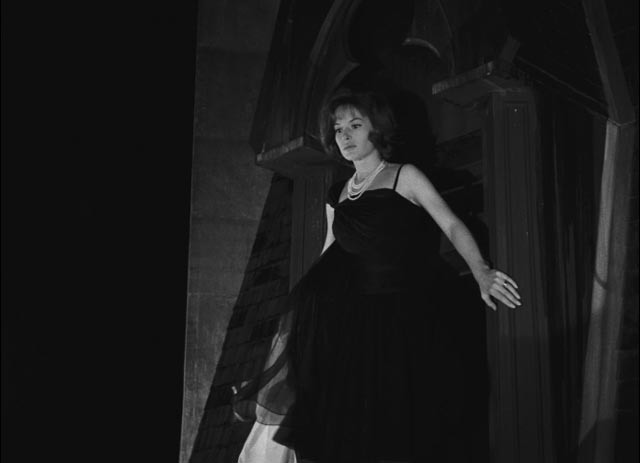 After Claude kills André, Jeanne goes mad, giving Franju an opportunity to film her climbing the tight spiral staircase in a tower, echoing the images of Christiane Génessier drifting through her home in Les yeux sans visage; and coming face to face at the top with an owl whose piercing stare has an uncanny sentience (visually prefiguring the bird imagery in Judex two years later). Because the narrative of murderous heirs vying for the inheritance remains largely undeveloped, the film has no satisfying conclusion. Instead, it rests on its metaphors for the cinema – the obvious one of the son et lumiere performance where a story is evoked solely through the play of lights over the building and grounds and elaborate sound effects which suggest action which remains unseen, while a voice narrates; and the perhaps less obvious one of the Count in his exclusive box seat, “watching” his relatives play out a drama he has set in motion for his own amusement. The presence of the Count behind his mirror also serves as the centre of a kind of ghost story. He is the spirit which inhabits and animates the old castle, imbuing it with an amused malevolence which threatens to destroy the relatives who had no particular affection for him, but rather saw him solely as a source of material gain. Although I’m pretty sure there’s no connection, I couldn’t help but be reminded of the malevolent Emeric Belasco, another privileged man determined to continue exerting his influence after death, hidden deep within the walls of his corrupt mansion in John Hough’s The Legend of Hell House (1973, from Richard Matheson’s novel); as in that movie, it’s only with the exposure of the Count’s presence that the other characters are finally released from the spell he has cast. Compromised in its production, Pleins feux sur l’assassin was poorly received by the critics and has remained an obscure work in Franju’s filmography, but now Arrow Academy has released the film in a dual-format edition with an excellent transfer. Marcel Fradetal’s black-and-white cinematography looks gorgeous, with deep blacks and rich contrast. Sound is clear, with a pleasant Maurice Jarre score. Along with a theatrical trailer, there’s an interesting oddity in a contemporary television show about the production shot on location (27:14). A mostly off-camera reporter interviews Franju and several of the actors about the production in an often glib and informal tone; that French TV would go to the trouble of giving this kind of coverage to such a film says a lot about the French respect for cinema at the time of the nouvelle vague. The booklet contains an interview with Franju and Boilieu-Narcejac about their collaboration and two helpful essays – by Chris Fujiwara and Raymond Durgnat – which go a long way towards explaining what went wrong with the production and what nonetheless turned out well despite the problems. Pleins feux sur l’assassin remains a minor work, but still has interest in the context of Franju’s career … and nonetheless contains many individual moments of cinematic pleasure. This entry was posted in Commentary, Review and tagged Arrow Video, Blu-Ray, Directors, Film History, French Film. Bookmark the permalink.